Students at New Jersey’s Hightstown High School never imagined they could have such an effect on the political system, let alone through social media. But have an effect they did. The students in Stuart Wexler’s AP Government and Policy class are completely responsible for a new law creating a database recording decades of unsolved civil rights cases. They drafted the bill themselves and lobbied to get it passed. And then, when the legislation seemed to be languishing on President Donald Trump’s desk, they did what high schoolers do best — they got on social media and tweeted at the president, at his advisers, at staffers, even at Trump-friendly celebrities to get him to sign the bill into law before it expired with the convening of the new Congress. The tweetstorm did its job, and the Civil Rights Cold Case Records Collection Act is now the law of the land. The law requires the National Archives and Records Administration to develop an archive of cold case civil rights crimes for public disclosure and to create a review board to oversee the process. The students became interested in the subject of cold cases in 2015 while learning about the civil rights movement. They were appalled that so many cases of racial violence — mostly involving African Americans — remained unsolved. “It’s just atrocious that these individuals have gotten away with crimes committed decades ago, for so long, even though the majority of Americans know it’s wrong,” 17-year-old senior Srihari Suvramanian told the Associated Press. At a school where 62 percent of the 1,500 students are kids of color, the subject hit home. 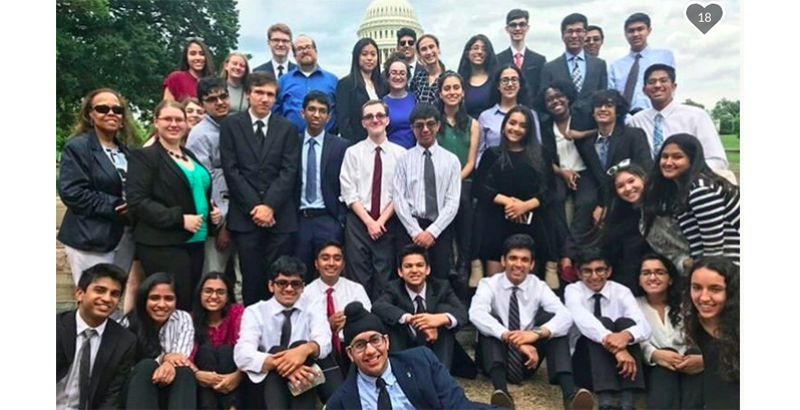 With Wexler’s help, the students worked on drafting the bill in class, and then they took frequent bus trips to Washington to lobby for congressional support — achieving the monumental step of getting the bill introduced into the House in 2017. There, it soon gained traction, and when Democratic Sen. Doug Jones introduced the bill on the Senate floor, Republican Sen. Ted Cruz was so moved by the students’ crusade that he signed on as a co-sponsor. By the finals days of the congressional session in December, the bill had passed the House and the Senate. All that was left was for the president to sign. “We went on a mad, desperate scramble to get the president to sign the bill,” James Ward, a 17-year-old senior, told the Associated Press. “We were tweeting at as many people as we could,” Suvramanian said. Update on #S3191 The Civil Rights Cold Case Records Collection Act has been signed into Law!! Eventually, word came that Trump had signed the bill into law — the first time, congressional historians believe, that a high school class has written legislation and gotten it enacted, according to the Washington Post. Hello, My high school wrote a bill that would release records on cold cases during the civil rights movement. If you could sign Bill #S3191 today, that would be great! Jones publicly thanked the class in a statement. “I am excited that their classroom idea and the solution we worked on together has now been signed into law by the President of the United States,” he told Newsweek. @KellyannePolls please help us get President Trump sign #S3191 Cold Case Collection Records Act!! It has been passed in both chambers, and advocated by Senator Ted Cruz.